Like Cloud Nine? Click here to view the entire range. Celebrate the birthday of someone special with this hilarious card from the Cloud Nine range by Redback. The text is written in the lovely silver foiled font that adorns the front of some of the Cloud Nine range. 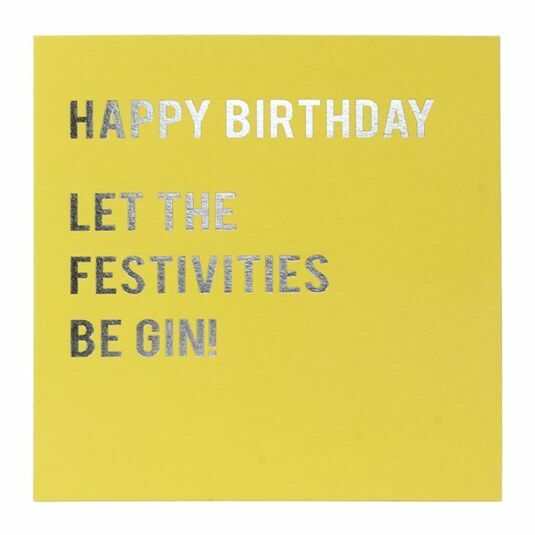 The message is clever and funny, no birthday is worth celebrating without at least a little bit of gin! The inside of the card is left blank, ready for you to write your own personal message to the lucky recipient of this card! It will probably bring a smile to their face, followed by a quick G&T! This card includes a white envelope. A collection of hilarious and quirky cards, using bright colours and foiled text. This collection of cards is sure to bring a smile to your face! These cards are perfect for birthdays, graduations, or any special occasion worth celebrating.